About 10 people were yesterday killed in Taraba State, Northeast Nigeria as two communities reportedly clashed, in Lau Local Government Area. According to official sources, the clashes broke out, afternoon between Shomo and Juole villages over yet to be identified reasons. Of the 10 killed, seven were children aged 3-10 years, it was learnt. A breastfeeding mother was reportedly roasted with her baby during the clashes. Several houses and other properties were equally destroyed, leading to widespread displacements, it was gathered. The clashes believed to have subsided came as Internally Displaced Persons in Plateau State had visited the State Governor, Mr. Simon Lalong to announce their intentions to voluntarily return home. Leaders of the IDPs at School of Geosciences camp in Anguldi, Jos South were yesterday noon at the State Government House to meet with Gov. Lalong over their return. Sources had said the IDPs who numbered about 3000 as of June 2018 had planned to exit the camp by next week. Welfare Officer of the camp, Mr. Francis Chong however confirmed the desire of all the IDPs to exit camp but said no date had been set. "The rainy season is near and we want to know from the Government how far about arrangements for our return because we want to go back to our normal lives," he said. 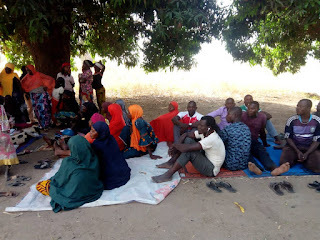 About 230 of the IDPs had been evacuated back to their villages in December last year through a joint effort of the State Government and Special military Task Force. Dozens of them were later said to have returned back to camp following renewed security threats and food shortages. However, food and water supply to the IDP camps appears to have dropped, forcing the IDPs to reconsider a home return. A visit to the camp reveals broken water containers and boreholes, abandoned cooking pots and a handful of children and aged people loitering idly. Many of them are believed to always leave camp in search of menial jobs within the surrounding communities. The State Government had entered agreements with the Federal Government to provide humanitarian and security support for the IDPs when finally resettled. A temporary mobile police barrack had been identified by the Government for renovation in one of the attacked villages - Kura Falls pending the construction of a permanent barrack in Gashish village as approved by President Muhammadu Buhari in June 2018.